This useful little book is one of the pocketessential film series books. It´s dedicated to Vietnam War Movies only. Each movie is summarized, cast and crew are named, some background and sub-text information is given and the movie is rated as well. 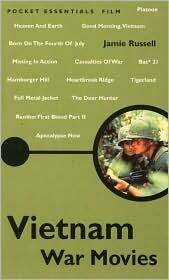 This entry was posted in Books, Movie Guides, Vietnam and tagged Books, Vietnam, War Movies. I found it on Amazon for $ .25 used. Looking forward to reading it. I love Vietnam War movies.